This month we would like to congratulate the Happy Hustlers 4-H Club for being awarded the Nebraska 4-H Club of the Month for August 2017. This Club from Chadron, NE, in Dawes County, has truly made a difference in its community. The club is dedicated to building strong citizenship and teamwork through various activities. The Happy Hustlers presented the annual 4th of July flag raising on Flag Butte, remembering milestones in history as the club is celebrating its 60th year right along with Nebraska’s 150th. This was the 55th year that the club has presented a patriot program on the 4th of July. The club also put together a booth at the Dawes County Fair showcasing its 60 years of members, leaders, projects and activities. The club was started 60 years ago by Ray & Phyllis Grantham and Robert & Nellie Hawthorne. Ray still resides in the Deadhorse community along with three generations of his family who have all been members of the Happy Hustlers. Happy Hustlers also completed their third event for the “Keep Chadron Beautiful” grant. The first event was this spring during the Earth Day celebration. The club took part in cleaning up trash in a portion of Chadron. 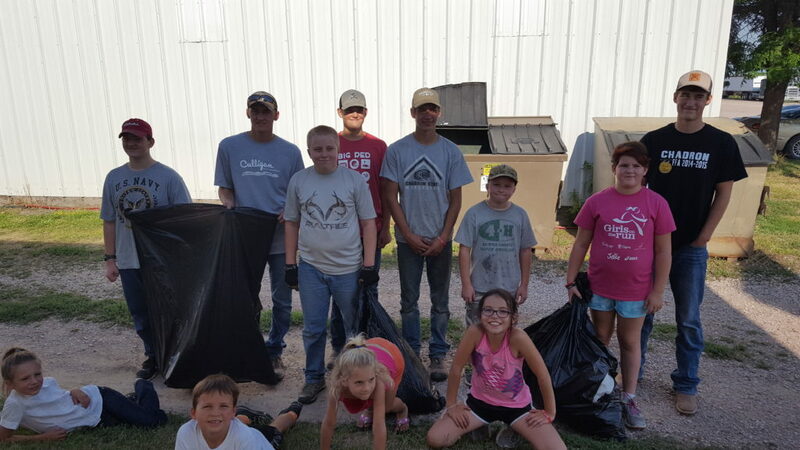 The second event included cleaning 10+ miles of rural Deadhorse Road and the third event involved cleaning the Dawes County Fairgrounds on Tuesday night of the county fair. No Comments to "August 2017 Club of the Month"